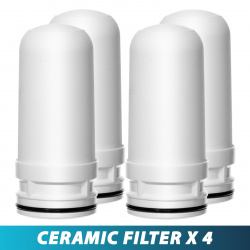 Fit standard size filtration replacement cartridges: 4.5"x10"
Oversized Fine Sediment and Double Premium Carbon Block. Removes a wide range of contaminants. 3/4" in & out for big flow. Standard replacement cartridges 2.5" x 20". 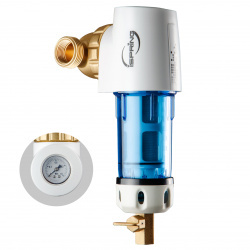 The iSpring CT10 countertop filter combines four different filtration medias in a single cartridge and housing. 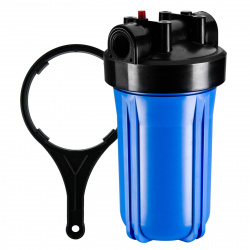 The filter combines activated carbon, dual layered sediment filtration, KDF media, and calcite to deliver the best drinking water possible from a single convenient cartridge. 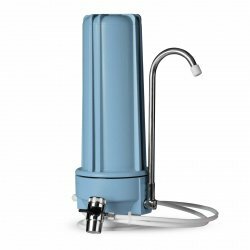 The CT10 effectively reduces fluoride, chlorine, lead, arsenic, sediment, VOCs, among other contaminants. The included faucet adapter comes with multiple thread sizes to fit nearly any kind of tap. 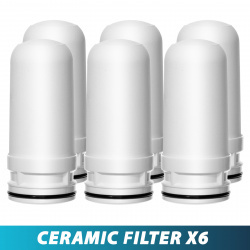 Installation and removal of the filter is quick and easy, making it a great choice for permanent and short term uses alike. The filter comes with a 1-year money back guarantee and lifetime support from iSpring in Alpharetta, GA at (678) 261-7611. 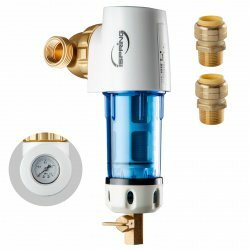 If you are in the market for a simple but effective drinking water solution, the CT10 makes an excellent choice. 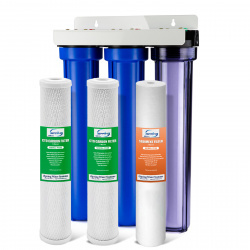 The iSpring CT10 countertop filter combines four different filtration media in a single cartridge and housing. The filter combines activated carbon, dual-layered sediment filtration, KDF media, and calcite to deliver the best drinking water possible from a single convenient cartridge. 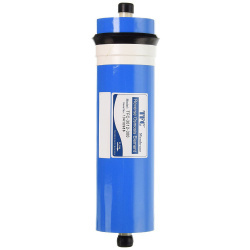 The CT10 effectively reduces fluoride, chlorine, lead, arsenic, sediment, VOCs, among other contaminants. 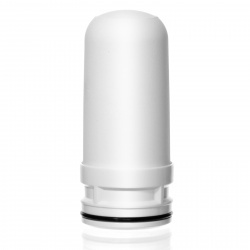 The included faucet adapter comes with multiple thread sizes to fit nearly any kind of tap. 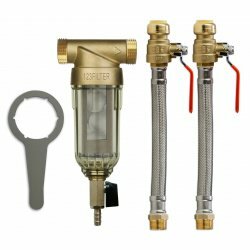 Installation and removal of the filter is quick and easy, making it a great choice for permanent and short-term uses alike. 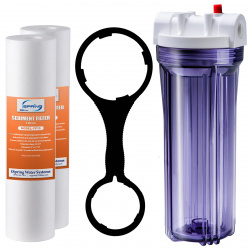 Fit standard size filtration replacement cartridges: 4.5"x10", which can be purchased at any water store. Recommend to change cartridges every 12 months. A: If you are on municipal water that isn't contaminated with heavy metals like iron, manganese and lead, the WCB32 is the system to go with. Naturally occurring metals are a commonplace in most well water sources however, and that is where the WGB22BM or WGB22B-PB earns its keep. If you are on well water or have heavy metals in your municipal water supply, you may want to consider the WGB22BM or WGB22B-PB over the WGB22B or WGB21B. For removing the common contaminants found in the majority of municipal water supplies however, the WGB22B or WGB21B fits the bill. 30,000-gallon capacity replaceable highly compact coconut shell activated carbon filter provides half year of clean water for your entire family. The WCB32 is equipped with back-to-back coconut shell carbon block filters. 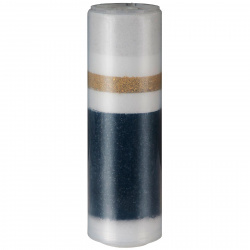 The densely packed carbon block filtration media provides more effective contaminant removal and longer filter life. (Tested by independent third-party to meet NSF/ANSI Standards: 42, 53 for drinking water treatment units). 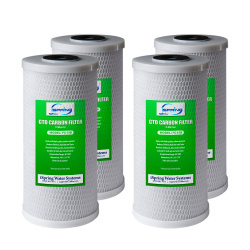 Standard replacement cartridges 2.5" x 20" (one set of three is already included: 1 Sediment + 2 CTO Carbon). 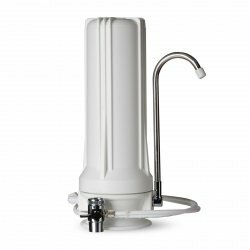 <li>Oversized Fine Sediment and Double Premium Carbon Block.<li>Effective in purifying drinking water instantly!<li>Removes a wide range of contaminants.<li>3/4" in & out for big flow.<li>Standard replacement cartridges 2.5" x 20". 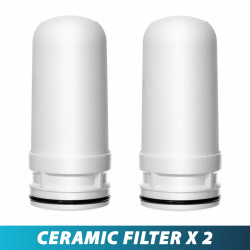 Fit 20” Water Filter Housings. 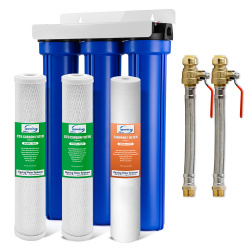 Good for the pre-filter housings (sumps) for RO systems, counter top water filters, and whole-house water filters. Approximate O.D. : 3 1/2” ; Compatible with #WCB32, RCB2P. Wrench and manuals, black metal bracket, three housings with caps, three filter cartridges, a housing wrench, two 3/4'' MNPT X 3/4'' push-fit hoses, plumber's tape and a removal tool.